I was so happy when Influenster and Honeywell choose me to review their Top Fill Cool Moisture Console Humidifier because my skin gets so dry and itchy during the winter and I really wanted to see if a humidifier will make a difference. Setting up the humidifier was very easy and straightforward (took me less than 10 min to get it setup). I am loving this humidifier but I have to admit the unit was a little bigger than what I was expecting. I put the humidifier in corner of my bedroom floor (No water leak). The humidifier comes with three speed settings to adjust moisture and sound level. The highest setting is obviously the loudest but not too loud to interfere with your sleep or any other activities. My house is always dry during winter because of the heat, this humidifier is definitely helping the moisture and air quality in my bedroom. I have only been using this humidifier for a little over a week and believe or not I have seen a major improvement in my dry skin and also in my allergies. My skin has been less Itching since I added the humidifier in my bedroom.I have asthma and I notice I have been using my inhalers less since I started using the humidifier not sure if this is suppose to help with this issues but my asthma and allergies are a lot better now. I ran the humidifier on the highest settings during the day and lower it at night to avoid the fan noise. I honestly, recommend this humidifier for everyone its worth it for the price and quality. 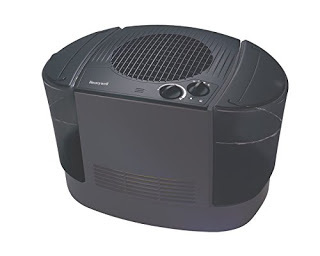 The humidifier is on the larger side but the good thing is in can be use in larger rooms like living room and family rooms. 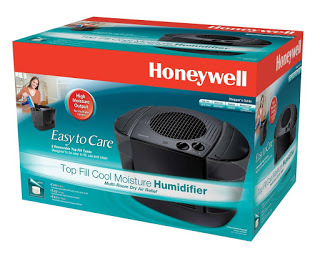 Disclaimer: I received the Honeywell Console Humidifier, complimentary from Influenster and Honeywell for testing purposes. This review is honest and unbiased. All opinions are my own.